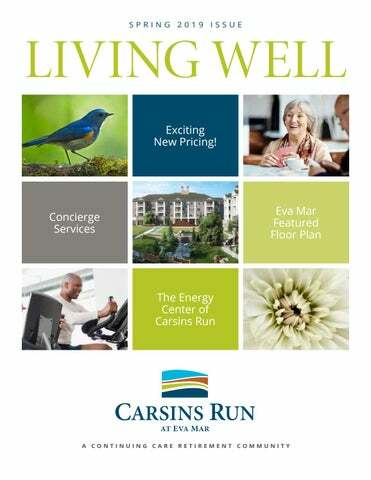 LIVING WELL Exciting New Pricing! FROM THE PR ESIDENT The Carsins Run professional team has been working diligently to reduce construction costs for the project so we can pass the savings along to our future residents. We’re thrilled about our new, lower 90% Entrance Fee pricing which will allow more people to afford the Carsins Run lifestyle. See more pricing details on the adjoining page. The community is filling up. The Hickory floor plan is currently sold out and some apartment styles are becoming more limited. Meet with one of our Retirement Counselors to reserve your specific location before it’s gone. We just announced a new benefit to Charter Members who reserve one of our spacious one-bedroom apartments (the Darlington and Bynum models). They will now receive four complimentary hours of downsizing consultation services from a professional OUR MISSION Providing Christian-based retirement living and future health care through the continuum of life in a warm and caring environment, dedicated to superb service and the values of dignity, trust and independence. downsizer. Spread the word. It’s been a busy time for the Carsins Run Charter Members who enjoyed spending time with each other at the annual holiday party at Rockfield Manor. The Charter Member Ladies’ Group has scheduled its first activity—a book club discussion group in March, and we are looking forward to a trip to the scenic Longwood Gardens in late April. Speaking of activities, the Carsins Run Event Center will be the perfect place for large group gatherings, holiday celebrations, exercise classes—you name it. In the Susquehanna Room, the “farm table” can be used for smaller group meetings such as book clubs, sewing groups and current events discussions. Our state-of-the-art fitness center will help you attain your fitness goals, all on your own time. Or step into our woodshop or arts and crafts room to stay creative. Come be a part of the fun! Experience the interactivity of display cooking and enjoy appetizers to dessert with waited service in the Maryland Room. What level of service can I expect at Carsins Run? Personalized services includes valet and concierge services. OUR 90% ENTRANCE FEE REFUND PLAN IS NOW 20% LESS THAN BEFORE. These reduced Entrance Fee prices have come from adjusting the location of our building plan resulting in significant savings in site costs. We encourage you to meet with one of our Sales Counselors so you may have a choice in your apartment floor plan, exposure and location within the community. This is when being a Charter Member gives you “Priority selection of residences in the community”. all Customer Service questions for our residents and their guests. The concierge will inform you of your guests’ arrival and direct them to your residence. She/he will be available to answer questions, provide information on where to find activities, transportation schedules as well as have any form necessary and available for you for activities, transportation, dining, etc. At the Concierge desk, you will also be able to arrange parcel pickups as well as pick up your pharmacy deliveries. Prepare to enjoy stimulating activities, good conversation and great friends at the Community Clubhouse—not to mention a healthy outlook in the state-of-the-art fitness center. Like to work with your hands? Bring out your inner Picasso with a wide spectrum of crafts and fine arts activities. Our Artist Studio offers a dynamic, flexible space for quilting, scrapbooking, painting, sewing and so much more—for both the novice and expert. Our Woodshop will be equipped with everything you need to build and form works of art. Let’s create beautiful things together, including long-lasting friendships. Sit back, relax and enjoy. Lounge around with a cup of java or tea at Pearce’s Coffee Mill—an ideal setting for warm (or cold!) treats and catching up with friends. You’re always in good company at Eva Mar, especially in the spacious Event Center. Take in a movie or get moving with line dancing or a relaxing Tai Chi class. The options are endless! Or make yourself comfortable in the Susquehanna Room— the site of a variety of social get-togethers. Read any good books lately? Reading enthusiasts and book club meetings are very welcome here. Prefer to play cards? This is where the competition gets exciting with bridge groups or impromptu poker games. This is your go-to for fun and friends. schools. In addition, he sits on the finance committee of the Christ Our King Presbyterian Church in Bel Air and is a 48-year member of the Bush River Yacht Club. CPA Karen Hoffman has a long and proud history with Carsins Run. Presbyterian Home of Maryland (PHM) was a client of the accounting firm that Karen worked for in the mid 1990s. During her tenure with that company, she was the Auditor for PHM. practice to the organization. In 2018, Karen ventured off on her own as President of K.L. Hoffman & Co., PC, a woman-owned CPA firm in Baltimore. Karen works with nonprofits and public organizations, and is involved in several charitable organizations in the local area. What she particularly likes about Carsins Run is the concept of continuing care. “Once you decide you don’t want to mow your lawn, paint your house or shovel snow you can join a larger community with others who have these same goals. LIVING ROOM 14'-6" x 12'-6"
MASTER BEDROOM 12'-0" x 18'-4"
MASTER BATH 12'-0" x 6'-2"
Eva Mar 2 Bedrooms, 2 Baths & Den / 1,320 sq. ft. Eva Mar sets the stage for a comfortable lifestyle— with a large master bedroom with double exposure and an open living room/dining room with brilliant daylight views. A large walkout balcony gives you a bird’s eye view of the lush greenery and breathtaking surroundings you will soon call home. Enjoy worry-free living, first-class amenities and a host of exciting activities at Harford County’s first and only Continuing Care Retirement Community. For more information, visit carsinsrun.org or call 443.903.2385. Lunches start at 11:00 AM. Brunches start at 10:00 AM. If Harford County Public Schools are delayed or closed, our event will be cancelled. NEW PRICING! Call today to learn more.